The best-selling duo of all time, Brooks & Dunn, debuts at No. 1 this week on Billboard’s Top Country Albums chart with their collaboration project Reboot. Proving “the timing couldn’t be better to celebrate the influence of Ronnie Dunn and Kix Brooks” (Music Row), the impressive feat marks the first time the duo has topped the album charts since 2009 while simultaneously earning the duo their 10th Billboard 200 Top 10 album, the most of any country duo or group in the chart’s history. The 12 track collection produced by Dann Huff “revisits some of the duo’s most iconic songs with the genre’s hottest young talents” (PEOPLE) including Kane Brown, Thomas Rhett, Brett Young, LANCO, Ashley McBryde, Brothers Osborne, Luke Combs, Midland, Cody Johnson, Jon Pardi, Tyler Booth and Kacey Musgraves. 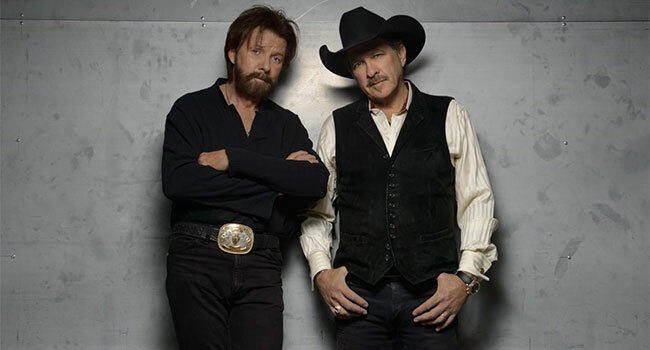 To mark the release, the next inductees into the Country Music Hall of Fame, Brooks & Dunn, took an “electrifying performance” (Billboard) of “Boot Scootin’ Boogie” with Midland to The Tonight Show Starring Jimmy Fallon, and a “thrilling take” (Rolling Stone) of “Brand New Man” with Luke Combs to Academy of Country Music Awards. With 20 No. 1 hits stretching back to 1991, two Grammy awards, dozens of ACM and CMA honors and a discography counting more album sales than any duo in history – regardless of genre – Brooks & Dunn’s influence on today’s country has never been in question. Hits like “Boot Scootin’ Boogie,” “My Maria,” “Only in America,” and “Believe” have propelled the duo to more than 30 million albums sold, with the New York Times heralding “together they helped drive the power-country era of the early-to-mid 1990’s and continued to benefit from the sea change in the genre they helped initiate right through their most recent albums.” Their original “Merle Haggard meets The Rolling Stones” vibe made them progressive stars in their own right. In 2014, the duo announced their reunion along with long-time friend, Reba McEntire, for a residency called Together in Vegas at The Colosseum at Caesar’s Palace in Las Vegas, which received rave reviews and continues to be extended including more shows throughout this year.